Earlier this week, I drove down Main Street. Main Street is all dressed up for Pride. 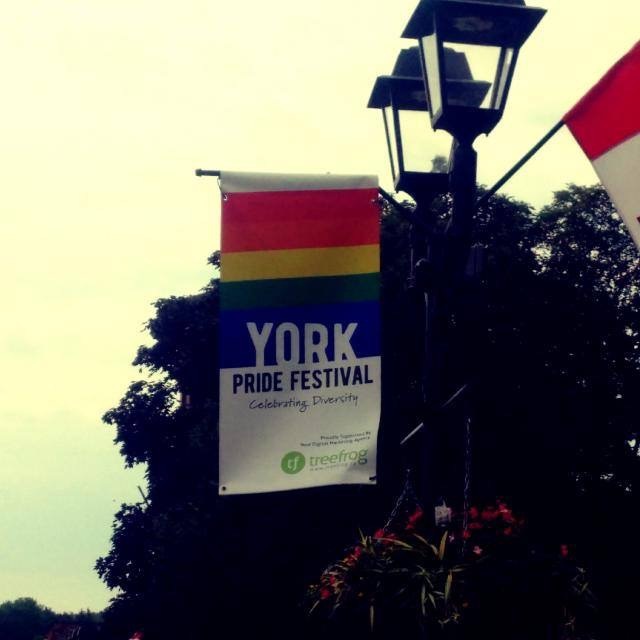 On the lampposts, you can see beautiful rainbow banners announcing the York Pride Festival. I must tell you that I was so overcome by the sight of these Pride banners that I had to pull over and have a little cry. The sight of these banners flapping in the wind for all to see may seem totally unremarkable to some people. But to some of us, the sight of those banners moves us beyond words to tears that spring from a very deep place within our soul; tears that reflect so many emotions born of pain, defiance, struggle, isolation, relief, hope, and joy! As I wept, I couldn’t help but marvel at how very much has changed since I first began to become aware of who I am. sadly, I suspect that most of the stuff that had her so tightly wound up she must have learned from the church. For centuries our public institutions, all too often encouraged or justified by the institutional church, confined generations of lesbian, gay, bisexual, transgendered, queer, and straight people in closets so dark that we could none of us see who we are. One of the blessings that we religious types have is a plethora of metaphors and stories that were created to liberate people from prisons of our own making. One of the stories that I have always loved is this morning’s first reading from the book of Joshua. 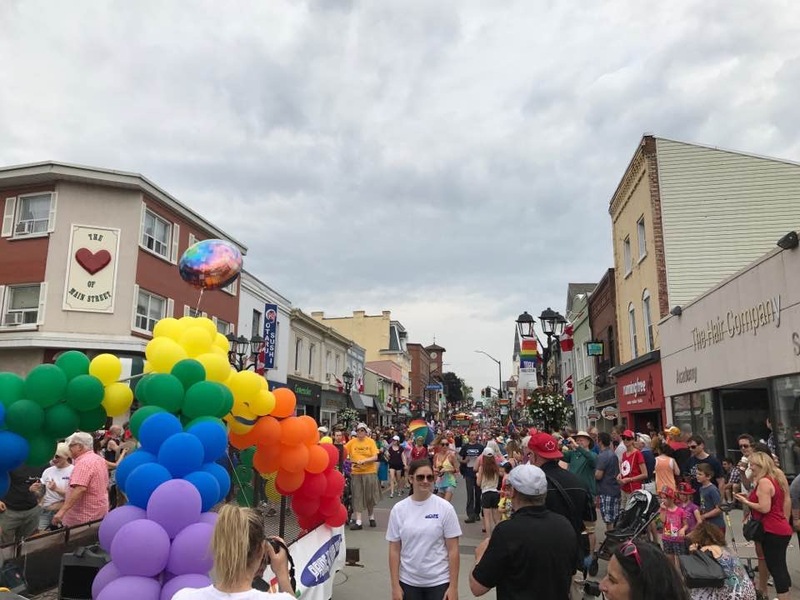 I can hear that old spiritual, “Joshua fit the battle of Jericho and the walls come tumbling down,” each and every time some uptight, repressed individual begins to complain about those gay’s and their parades. The very idea of the children of Israel, those ancient Hebrew migrants, persecuted and excluded marching and hollering all around the mighty city of Jericho, with its walls erected to keep the riff raft out, well the metaphor is too perfect. I can see it all now day after day, people making an ungodly racket. The sound of the shofar’s loudly blasting a radical tune. I’ll bet there was dancing and singing and hootin and hollerin. No wonder those walls come a tumblin down. The scriptures are full of stories created to provide hope to the downtrodden, the oppressed, the persecuted, the suffering, the outcast, even the sinners. Yes, the walls may be tall, the structures that keep you out may be entrenched, but make enough racket and you’ll see those walls crumble. So, today I give thanks to all those rowdy folks who marched in spite of the fact that the walls erected by our society to keep them in the closet seemed insurmountable. Today, I celebrate all the brave pride-goers who brought the walls of injustice down so that we can be all that we are created to be without fear. It has been a long and difficult struggle, and our pride celebrations inspire such joy. So, we sing, we dance, we make noise and yeah, we flaunt our sexuality in public! And I’m guessing that the gay rights movement has liberated more than just the LGBTQ communities. I’m guessing that our straight sisters and brothers have learned a great deal about who they are. I’m pretty sure that liberation and freedom from sexual repression are indeed a blessing that more than just a few of us are grateful for. The reality that we a wonderfully and beautifully made, creatures of mysterious and sublime wonder is a blessing of unfathomable joy. So today, we celebrate who we are! But with each and every utterance of, the words “Happy Pride!” we cannot forget that our joy is tinged with sadness for all our sisters and brothers around the world who continue to live and die in fear. The Pride movement is still in its infancy. We have come a long way. But we have miles to go and so many more wall to break down; walls that will require a whole lot of noise before they come tumblin down! We are blessed to live in a place where we can be who we are and love one another without fear of the state. Sadly, there are still places here where some of us are afraid to hold hands. There are places where some of us fear to go. We will need to do a whole lot more marching. We will also need to make a great deal of noise so that our government opens gaps in our walls so that we can provide sanctuary to LGBTQ refugees. We will need to make a great deal more noise so that hate-filled states like Chechnya will stop the killings and Malaysia will stop the public floggings. Those of us who remain in the Church must continue to make a whole lot of noise so that our institutions repent the abuses of our past and stop the abuses that continue to be perpetrated in the name of Jesus. We must do our best to join our voices to the voices of those outside our walls so as to hasten their crumbling. We must open up dialogues and we must tell our stories so that the LOVE that lives in us can inspire hope as it breaks down walls. We must remember that the one whom we profess to follow this Jesus fellow, is the one who said over and over again, “Do not be afraid. Have no fear!” The very one who reached out beyond the confines of the walls established by the structures and institutions of his day, to love his neighbours. The same one who insisted that God is LOVE. So, as we celebrate today, we do so mindful that there is more noise for us to make and hopeful that as we make that noise together the walls will come tumblin down. Happy Pride everyone! May the LOVE that is God empower all of us to be all that we are created to be. 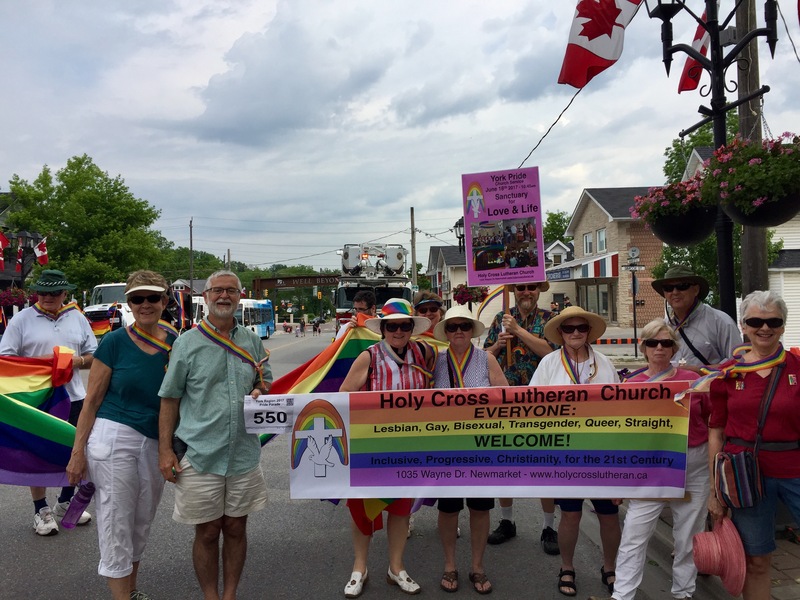 This entry was posted in Home, Progressive Theology, SERMONS, STORIES, Theology and tagged #yorkpride, emergent theology, emerging church, LGBTQ sermon, LGBTQ worship Newmarket, progressive christian sermon, progressive Christian sermon Joshua 6:1-5, progressive christianity, progressive theology by Rev. Dawn Hutchings. Bookmark the permalink.